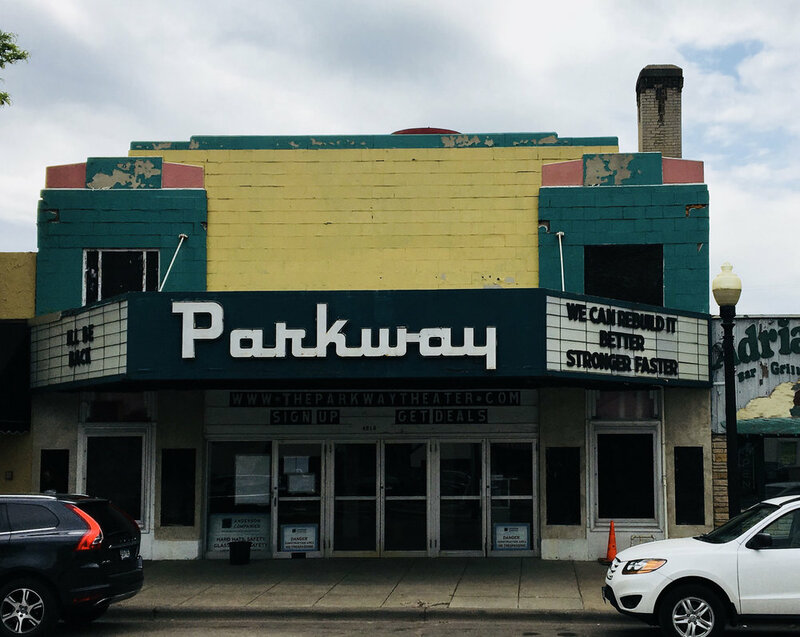 Minneapolis, MN, August 6, 2018: After months of renovation and anticipation, the historic Parkway Theater in South Minneapolis will reopen on Thursday, September 13th with a full schedule of movies, music, and more. Throughout its 90-year history, the Parkway Theater has brought generations together to experience first-run features, classic cinema, and live music. Following the theater’s first major restoration in over 40 years, the new Parkway will honor its history with a continued dedication to classic 35mm films, while exploring the room’s potential as a performing arts space with a Fall 2018 calendar of world-class arts, comedy, and conversation series. The remodeled theater highlights the building’s Art Deco origins while completely revitalizing and modernizing the space. In the lobby, a brand new bar offers local craft tap beer options along with a gourmet cocktail menu designed by Tattersall Distilling. Classic and local concessions will always be available along with the Parkway’s beloved fresh buttered popcorn. In the theater, an updated sound system, two beautifully restored 35mm projectors with dramatically brighter bulbs, and a new industry-standard digital projector create an updated, state-of-the-art cinema experience. The Parkway’s original historic seats have been reupholstered and painted, and strategically positioned to allow for significantly increased legroom. A new addition to the lobby holds several classic coin-operated arcade games and two additional main floor bathrooms. The Parkway officially opens with Steven Spielberg’s Jaws, screened in its original 35mm format on 8pm, Thursday, September 13th, launching a weekly Classic 35mm Movie series. Each Thursday at The Parkway will be exclusively reserved for classic 35mm screenings, giving audiences the rare opportunity to see their favorite films in their original, intended format. New films and documentaries will also find a home at the theater, with the premieres of three Minnesota filmmakers’ works planned for Fall 2018: Lights! Cameron! Jackson! from Dave King and Noah Hutton on Friday, September 14th; Sweetness of Wild by Junauda Petrus via the artist collective Free Black Dirt on Wednesday, October 3rd; and Duluth-filmed In Winter by Alexander P. Gutterman and Aboubacar M. Camara on Sunday, October 21st. The Parkway’s performing arts calendar highlights Twin Cities-based, internationally recognized artists such as jeremy messersmith, Dave King, Ashwini Ramaswamy, and David Huckfelt while also welcoming widely acclaimed and talented national acts such as Saint Paul Chamber Orchestra-featured pianist and composer Gabriel Kahane; longtime essayist for The New Yorker Adam Gopnik; and the uncategorizable instrumental duo Subtle Degrees, consisting of composer + saxophonist Travis Laplante and drummer + improvisor Gerald Cleaver. In addition to performing arts, the Parkway’s stage and screen will feature collaborations with partners including the Film Society of Minneapolis St. Paul, whose annual Minneapolis St. Paul International Film Festival will take place April 4-20, 2019; the newly formed Spit Take Comedy Series, a new performance series that brings some of the country's best comedians, actors, and performance artists to MSP; and an ongoing relationship with political improv and sketch comedy troupe, Theater of Public Policy. The Parkway will also partner with 98.9 FM - KRSM, a hyper-local platform for amplifying the voices, stories, cultures, and conversations happening in South Minneapolis, for a fundraiser and screening of ROCK RUBBER 45s, an incredible documentary about “NYC culture orchestrator” Bobbito García. Keep up with the reconstruction and be the first to hear about upcoming events and announcements.